The beautiful Periyar Lake sits in the middle of Periyar National Park, South India’s most popular wildlife sanctuary. The massive 26 sq. km long ancient 120-year-old artificial lake was created by the British and attracts a lot of wildlife such as Indian bisons, gaur, etc. for whom the lake is a permanent source of water. The submerged trees make for an interesting picture as one takes the 1.5 hr Periyar lake cruise, where one might even spot boars, otters, and deer. Other exciting things to do in the Periyar Reserve include visiting the tea gardens and spices factories, do the thrilling ‘Tiger Trail’ trek, bamboo rafting, as well as engage in nature walks, hiking and trekking. The plantation town of Kumily, which is known as the ‘Spices Capital of India’ and the ‘Gateway to Thekkady’ is the nearest town to Periyar Lake around 11km away. The Kabini River flows through the Kabini Wildlife Reserve, one of Karnataka’s most popular wildlife destinations due to its stature as a lush green landscape which houses a diverse variety of wildlife. Holidaying around the Kabini River allows couples to experience the wildlife of the Western Ghats up and close and indulge in thrilling night trails and wildlife safaris, coracle rides on the river, dining by the riverside, living in luxury tents and camping out in the wild, trekking and cycling off-the-track in the reserve, bird watching and animal sightings, boat cruises on the river, bonfires, and even kayaking on the river waters. couples can also explore the Kabini Dam where one can supposedly find 250 species of birds as well as spot animals such as langur, leopard, and the Asian elephant. Nature and adventure make for a heady mixture in Bheemeshwari which is located on the banks of the mighty Cauvery River in the Cauvery Wildlife Sanctuary, Karnataka. The region is famously known as the ‘Elephant Corridor’ due to having one of the highest densities of wild elephants in India. Couples can head straight to the Bheemeshwari Adventure and Nature Camp on the riverbanks, the region’s most popular holiday destination. They can indulge in mountain biking, zip lining, kayaking, river rafting, sightseeing, and trekking, camping on the riverside and staying in jungle huts, exploring the forest on cycles, as well as a bunch of thrilling rope-based activities. Couples can also explore the Bharachukki waterfalls, the Galibore Fishing Camp, and the famous Anjaneya Temple dedicated to Lord Hanuman in the vicinity. The piercing white waters of the Kali River in Karnataka set the stage for a thrilling, adventurous and picturesque holiday in the throes of the Western Ghats. Couples can head straight to Dandeli, which is the kernel for experiencing the biodiversity of the Kali River and the Dandeli Wildlife Sanctuary, which is the state’s second largest. Couples can indulge in a plethora of adventure sports such as whitewater rafting, coracle boat riding, and kayaking on the river waters, cycling, mountain biking, trekking, and hiking. Travellers can also explore the lush environs of the Dandeli Wildlife Sanctuary and try and spot the rare black panther or go birding, go for a safari in the Anshi National Park, visit some of the unique tribes of Dandeli, explore the stalactites and stalagmites of the limestone Kavala Caves, and even picnic or camp near the Sinteri Rocks. The vast expanse of the gargantuan, 2000 km2-large brackish-freshwater Vembanad Lake spans several districts in the state of Kerala and is India’s longest lake. The towns of Kumarakom, Kochi, and Alleppey lie on its banks at different points, and the lake is at the heart of Kerala’s famed backwaters. 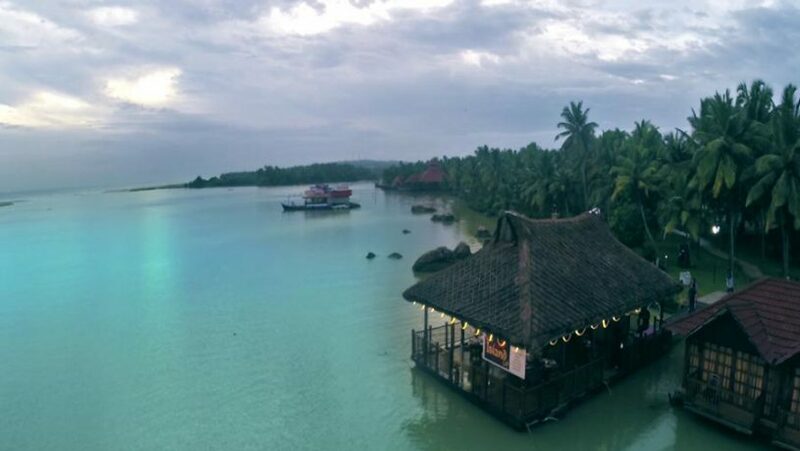 Couples can stay on one of the hundreds of Kettuvallams (houseboats) on the waters of the lake or in one of the many luxurious resorts on its banks. They can enjoy fishing and boat rides on the lake as well as enjoy the spectacular water regatta and snake boat races that take place during Onam when boats carrying more than hundred singing oarsmen in each slice through the waters. Apart from exploring the lake and what it offers, travelers can also explore the attractions in the cities on it such as the Kumarakom Bird Sanctuary, the Tourist Village, the Bay Island Drift Museum, the Krishnapuram Palace in Alleppey and the Mattancherry Palace and the Paradesi Synagogue in Kochi, among many others. So, what are you waiting for? Share this article with your better half and head to one of the best honeymoon places in South India for your exclusive romantic escapade.